There is no elevator to the upper floors of this venue. The mezzanine requires climbing approximately 30 stairs, and balcony seating requires approximately 60. More accessibility information for the Cutler Majestic Theatre. Emerson College’s Cutler Majestic Theatre opened on February 16, 1903. While originally designed for opera and the theaterical arts, the Majestic has served many purposes through the years, transforming into a hub for vaudeville, then a movie theater and now a performing arts center. 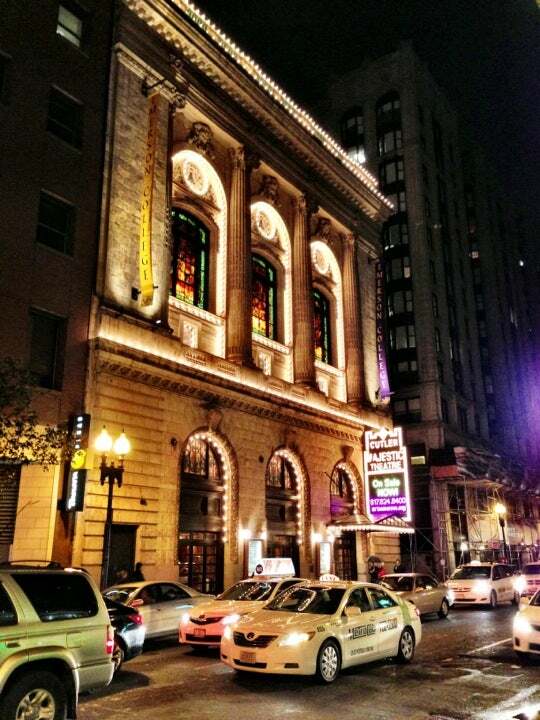 The “Beaux Arts” style theater is a member of the national League of Historic Theatres and is a Boston Historic Landmark. I wore Sandals and capri pants. If going to the Emerson Theatre make sure to bring a sweater or jacket. Very cold there..
beautiful theater at the Cutler in Boston, intimate, great seat anywhere in orchestra including rear area. My first time there. Heard China Pearl is great in Chinatown as you are close. There is a Panera right next to the theater. An average pizza place across street. The weather was sunny at first on the afternoon. I wore semi-casual to dressy. I went in jeans to this one as a lot of white folks in Boston dress down, but many black folks like to dress up. I went to a matinee. Bring a sweater or jacket as the a/c was cool in there. If you validate your ticket, you can park for about $12 at the theaters parking lots or nearby little lots. We parked at LAZ and it was a few blocks walk as I cannot walk far.. There's a lot of construction in the area. Not many meters, but you may get lucky. However, ArtsEmerson is the only theater company that I know of in Downtown Boston that offers reasonable parking ($12). Eat at Jacob Wirth's on Stuart St., nearby. Mostly German food but light fare as well.